Synopsis: Btw, I got the chapter title totally wrong for the previous chapter review. Anyway, this chapter looks like an obvious allusion to Ano Hana. I oughta watch that anime someday. I’ve heard good things about it. I'd put in Hina's cover up there, but you know what... I dun like Hata's cover art this time around - and it has nothing to do with Hina as a character, btw. So like, Hinagiku is somewhere inside some kind of locker room complaining about Hayate’s behavior while still dressed in the bunny girl outfit from the previous chapter. Finally, the “LIFE” building is fully restored by Kotetsu and as thanks, Hayate gives him a ticket (looks like a train ticket) and tells him to use it to leave immediately while calling him an idiot. Even Maria (still in bunny girl outfit) complains that Hayate is being a little too dirty, but Hayate counters that he needs to use every available option and fast because seaside restaurants don’t get customers during the night. Maria sees his point since according to her, only “wildlife” in the form of nocturnal delinquents with fireworks come out to the beach at night. 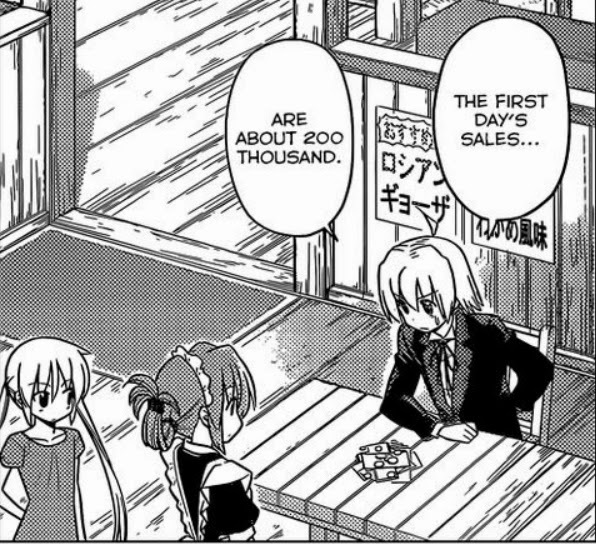 Thus, Hayate convinces her to keep helping out because there’s really not a lot of time to win this bet with Ikusa. Sounds legit. Do it, Hayate! Night falls on the first day and LIFE has made about 200 thousand yen, which according to Chiharu, is an amazing amount, but Kayura points out that it’s nowhere near the 8.9 million yen goal. Everyone starts pitching in relatively useless ideas as to how to increase sales. 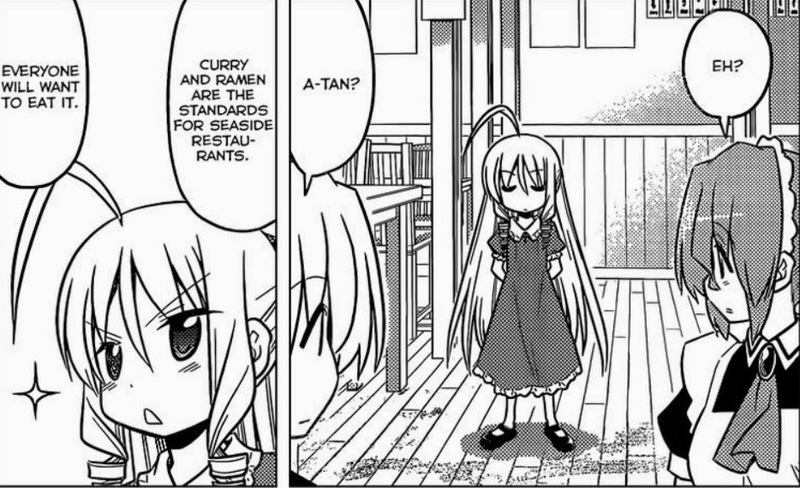 Suddenly, Alice (who now probably has all of Athena’s memories) suggests making delicious curry because curry and ramen are standards for seaside restaurants. Hayate asks why she chose curry if Ramen is standard too and she bluntly says that it’s because she likes curry (good one, A-tan). So now Hayate poses the question: how does one make delicious curry? 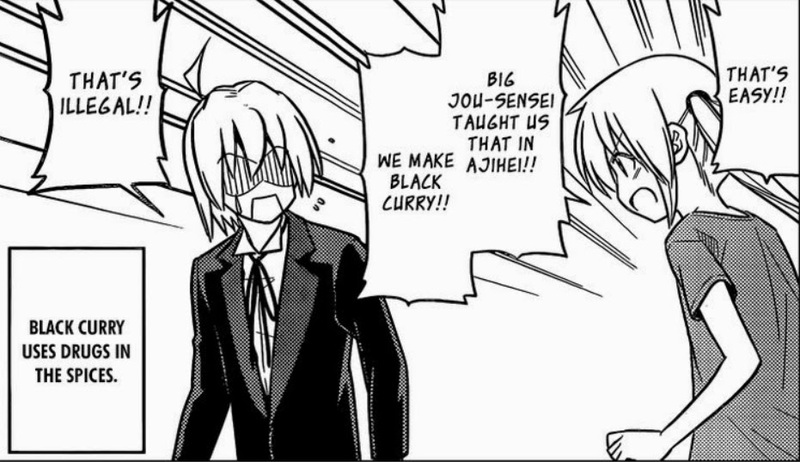 As usual, Nagi is quick to interject with an obscure manga reference and suggests making “black curry.” Unfortunately, Hayate says it’s illegal because apparently, Black Curry uses drugs in the spices. Athena comes up with a more sensible suggestion and talks about an island with legendary spices which she happened to hear about while gathering info on Ikusa, and it’s apparently a deserted island within boating distance. Athena offers to lead him there. Chiharu says that a deserted island at night is dangerous and Hamster uses the “nocturnal delinquents with fireworks” gag just like Maria. 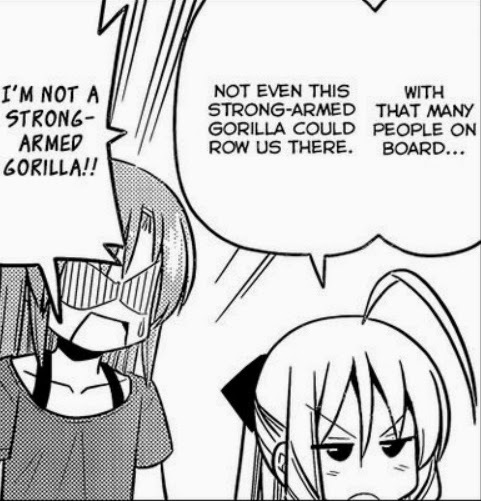 At this point, Hina suggests going with Hayate and Athena since she can row a boat as well as handle any “nocturnal delinquents with fireworks.” Hamster is worried for other more obvious reasons about this idea and insists on coming too, but Athena quickly puts a stop to that because with that many people on board, not even the strong-armed gorilla could row the boat there (Hina). Athena: I'mma zing you while you ain't lookin. So with that, everyone is set for a little night trip to the deserted island of awesome spices or what-not. The boat is some kind of swan-boat, but that aside, Chiharu uses this moment to tease Hina into making a move on Hayate, but the girl is totally oblivious and is thinking more about getting back at Hayate for the bunny-girl incident and wants to whack him (do it) when she sees an opening.) Hamster is envious about Hina and Hayate being on this deserted island at night, but Chiharu doubts that anything will happen. The trio finally arrives at Higan island, which is totally deserted and looks like some kind of rpg dungeon. At this point, Athena thinks it’s a good time to let everyone know that there’s a horror story attached to this village (lol). Apparently, a village of 20 used to lie there, but one night, one of them murdered everyone else and then committed suicide and the spirits of the murdered villagers have been haunting the island ever since. Hina senses a ghost and immediately grabs Athena’s head like a plushie (lol) and asks what that was, to which Athena bluntly responds that it was the spirit of a murdered villager. Next, Hina hears someone going “gyah gyah” and Athena nonchalantly states that it’s probably the voice of the murderer’s spirit. She also adds that overcoming the danger of this place is what makes the curry so delicious. At this point, Hayate automatically enters hyper-gigolo mode and takes Hina’s hand and promises to make sure that he’d… but he never finishes what he was about to say because they both fall through some kind of wormhole in the sand. Review: As usual, Hata’s penchant for misdirection is showcased in this chapter. You young-uns might call it “trolling,” but I don’t like to use that term, when it’s clearly being used as a legitimate literary device all throughout this manga. It’s more of the author’s style rather than a pointless troll. 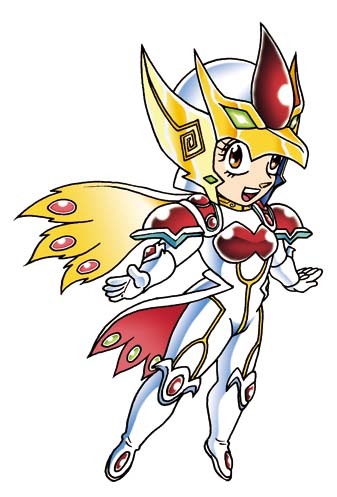 Yes, I know many of you were expecting the return of full-sized Athena in this chapter, but unfortunately, you’re not gonna get it just yet for this chapter. If there’s anything that I have to say about this chapter, it’s that Athena was absolutely awesome in it. I love the comedy dynamic between her and Hina – especially when they finally set foot on Higan island. Hina just makes the best straight man/girl for Athena’s deadpan responses. “Nocturnal delinquents with fireworks” gag was also pretty funny. Definitely loving the comedy in this chapter. With that said, looks like this arc is proceeding at a pretty brisk pace, which is quite a refresher from the sluggish developments in the previous doujinshi arc involving Ruka. 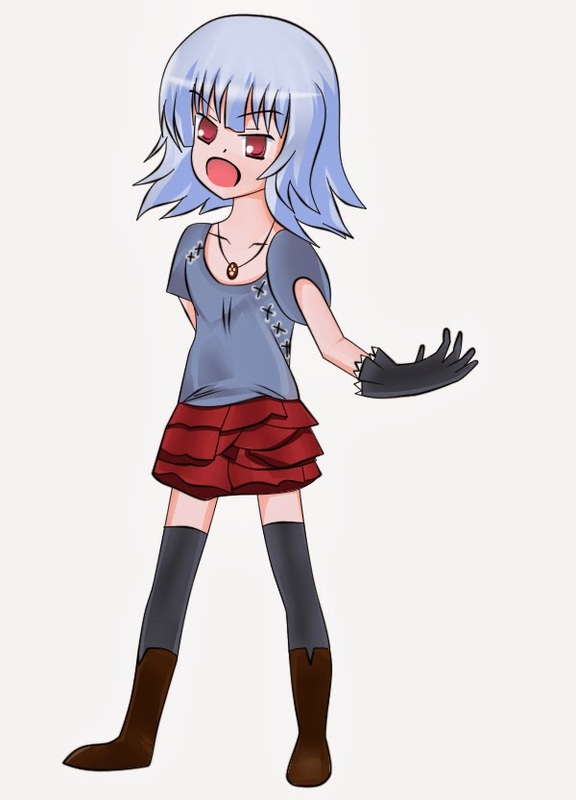 Speaking of Ruka, I got so bored waiting for the next chapter, that I managed to finish making this fanart of her while awaiting the scanlations. The pose and outfit are based on Risa Oribe and her performance of Oath Sign. She whose ship has been sunk. It seems like nothing came of Athena's little talk with Hayate in the previous chapter, or it could be that Hayate's realized the error of his ways, but still needs to push through with his plans in haste anyway. He seems to be treating Maria a little bit better. Speculation corner: I’m going to add this little section here, because I’ve noticed that I tend to make these speculations every now and then. 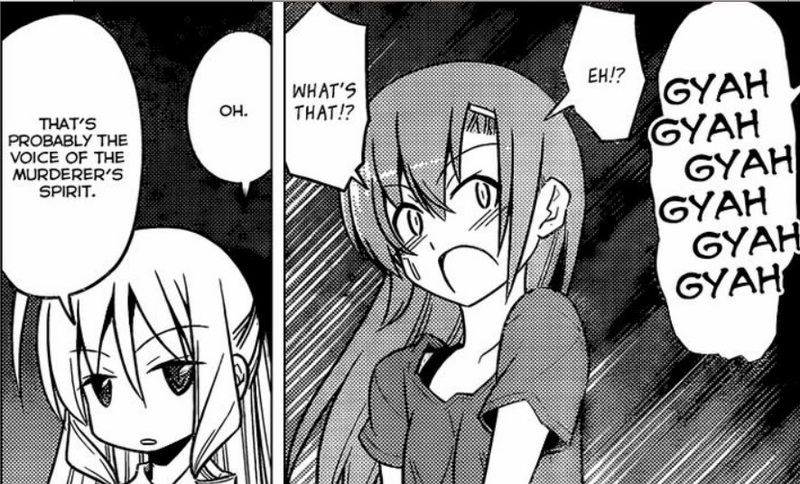 So for this chapter, we have some possible hints of development on the Hayate-Hina angle in the next chapter – of course, it could be a red herring again, because Hata just loves those. 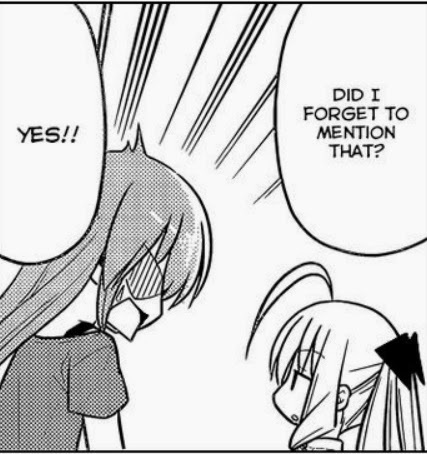 In any case, when Hayate and Hina’s adventures on Higan island do continue, I expect that Hina might use this opportunity to finally confess to Hayate – which would actually tie in with that seemingly pointless airplane chapter 438 wherein she promises to confess to him if she survives riding the Airplane. In fact, even the caption at the end of this chapter suggests that some kind of romance would begin… maybe. With that said, while being firmly on the dual MC ship, I strangely welcome this latest development. As we have said for years, we need more Hina-Alice chapters as they can be damn funny when together. It's a pity that they are not trying to even make original stories about them into an OVA. I don't really expect any huge progress between Hayate and Hina, but I see somewhere that people are taking the possible lack of real progress as proof that the ship will sink. Weird. Personal preferences aside, I don't expect Hata to sink the Hayate x Hina ship yet, if ever. There are several reasons plot-wise why I think it wouldn't be a good idea -- aside from marketing reasons :D. Ruka was obviously doomed from the very beginning and IMO, Athena sunk her own ship, but I don't see any of that happening with Hinagiku. What I am waiting for in this arc is for Hayate to get some real character development as the MC and perhaps sort his feelings out. Only then should we proceed to the different shipping angles and sinking/sailing with certain ships. IMO, he's even worse than Nagi when it comes to EQ. 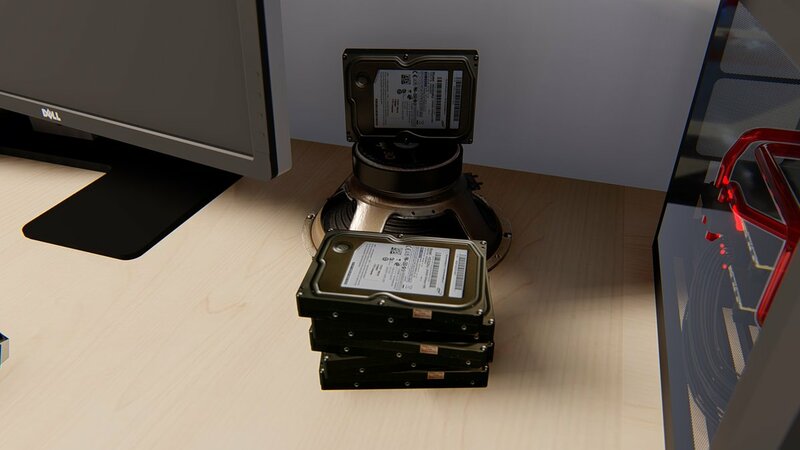 Heh, I only managed to find one reason plot-wise. If Hina's love for Hayate survives this arc/saga/age I might finally have enough evidence to put it into an article. Yea, I do not have the guts to do it now. Alice really was great this chapter. Perhaps you're right and this will just be a way to push Hayate along towards realizing his own feelings without anything too important happening.